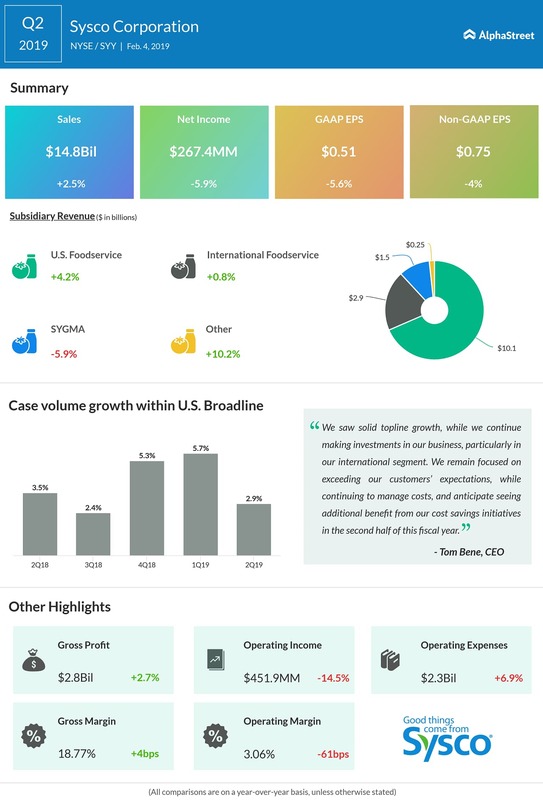 Sysco Corp. (SYY) reported a 5.9% drop in earnings for the second quarter due to higher costs and expenses. The bottom line exceeded analysts’ expectations while the top line missed consensus estimates. Following this, the stock inched up over 2% in the premarket session. Net income fell 5.9% to $267.4 million and earnings dropped 5.6% to $0.51 per share. Non-GAAP earnings decreased 4% to $0.75 per share. Sales rose 2.5% to $14.77 billion helped by a 4.2% growth in the US Foodservice Operations sales. Sales from International Foodservice Operations rose 0.8% as foreign exchange negatively impacted sales by 0.7%. Sales from Sygma declined 5.9% while other sales increased by 10.2%. Local case volume within U.S. Broadline operations increased 3.3%, of which 2.4% was organic, while total case volume within U.S. Broadline operations grew 2.9%, of which 2% was organic. Sysco continues to invest in its business, particularly in its international segment. The company continues to manage costs and anticipates seeing additional benefit from its cost savings initiatives in the second half of this fiscal year. Sysco recently implemented organizational and executive leadership changes that result in an approximate 10% reduction in salaried corporate support positions. Cash flow from operations was $917.8 million for the first 26 weeks of fiscal 2019, which was $15.4 million lower compared to the prior year period. Free cash flow was $700.9 million, which was $22.4 million higher compared to the prior year. Capital expenditures, net of proceeds from sales of plant and equipment, totaled $216.9 million, which was $37.8 million lower compared to the prior year period. Shares of Sysco ended Friday’s regular session down 0.44% at $63.57 on the NYSE. The stock has risen over 3% in the past year while it has fallen over 10% in the past three months.